Montana and Wyoming are fortunate to possess the two important pieces of a viable hydropower resource: water and elevation. Although both states often suffer from drought, many of our water resource come from perennial high elevation resources, which creates an opportunity to harvest clean energy from falling water. The scarce nature of developable hydropower resources means that landowners need to understand the two important characteristics of a hydropower resources: head (elevation) and flow (water). Measuring head can be a difficult task for landowners. The services of a professional surveyor or engineer may be required. A U.S. Geologic Survey topographic map can be used to approximate the available head, as can an altimeter or GPS unit. These will provide rough estimates of available head. Several more precise methods can also be used by the more intrepid landowner seeking to estimate head, including attaching a graduated pressure gauge to a temporary hose or using a surveyors transit or laser level to estimate head. These methods are described in detail in Micro-Hydro Power: A Beginners Guide to Design and Installation from the National Sustainable Agriculture Information Service. The other vital component of available energy is the amount of water that is available to be diverted to the penstock. It is important to remember that stream water flows, especially in Montana and Wyoming, are highly regulated and can be quite seasonal. More water is often available in spring and early summer during snowmelt than in late summer. This variation can impact your expected energy production, and it is important to remember that an average flow with great seasonal variation may not be the most accurate measure on which to base the sizing of a micro-hydro system. Some landowners already know how much water is in an existing canal or pipeline is available to them based upon documents provided as part of a water right. Simple methods can be used to estimate the amount of water available for a micro-hydro system. For example, contact your local irrigation district, water supply, or USDA Natural Resource Conservation Service office to see if they have the flows for the waterway. If these are unavailable, several do-it-yourself methods are possible, including the bucket-and-weir and float methods. The bucket measure is simply diverting the waterway into a bucket of known volume and timing how long it takes to fill. The weir method involves a temporary structure that diverts the water through an opening of known size and depth. A float is then used to measure the velocity of the water that flows through the opening. 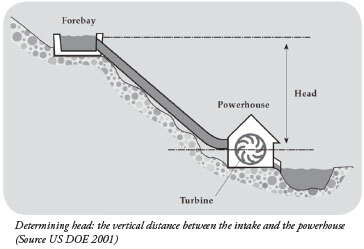 Once again, the Micro-Hydro Power: A Beginners Guide to Design and Installation from the National Sustainable Agriculture Information Service is an excellent resource for a detailed description of these methods. Adequate head – Although heads as low as three feet can be viably harnessed, sites with at least 10 feet are generally needed to be economically viable. Existing civil works – Locations that have existing infrastructure, such as diversions, dams, or penstocks, will often have lower development costs. Proximity to a load – Many good micro-hydro locations are located far from buildings or other electric loads. Just like other renewable energy systems, transporting electricity over long distances increases cost and reduces efficiency. Minimal environmental disturbance – Although regulatory constraints will be discussed further in Section 4: Regulations, it is useful to consider the environmental impacts of your system. Clearly identified water rights – In both Montana and Wyoming, access to water is controlled by strictly defined water rights. Water flowing across your property does not necessarily give you access to the resource, even for non-consumptive use in a hydroelectric plant. In addition to simply knowing the characteristics of waterways and canals on your property, other methods exist that help you identify potential locations for hydroelectric facilities. One of the best is Idaho National Laboratory’s Virtual Hydro Prospector. This web-based geographic information system (GIS) resource will let you examine micro-hydropower potential on all naturally flowing waterways across Montana and Wyoming. Please visit http://hydropower.inel.gov/prospector/index.shtml to access the tool. You can also contact either Montana or Wyoming Cooperative Extension Service for help using the tool. Idaho National Laboratory. Hydropower Program. Available at http://hydropower.inel.gov. 1 A friction loss table is provided in the referenced Northeast Regional Agricultural Engineering Service – University of West Virginia Cooperative Extension Service publication.